Welcome to the most complete, comprehensive and flexible HTML website template, for Ecommerce Business. 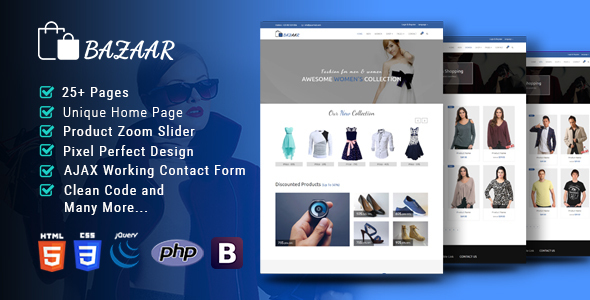 Bazaar– Multipurpose Responsive eCommerce Template is a clean and elegant design – suitable for selling clothing, fashion, high fashion, men fashion, women fashion, accessories, digital, kids, watches, jewelries, book, shoes, kids, furniture, sports, tools. It has a fully responsive width adjusts automatically to any screen size or resolution. Home page is designed eye-catching with large slideshow above and below Mega Menu. Slideshow is great with smooth transitions of texts and nice images.